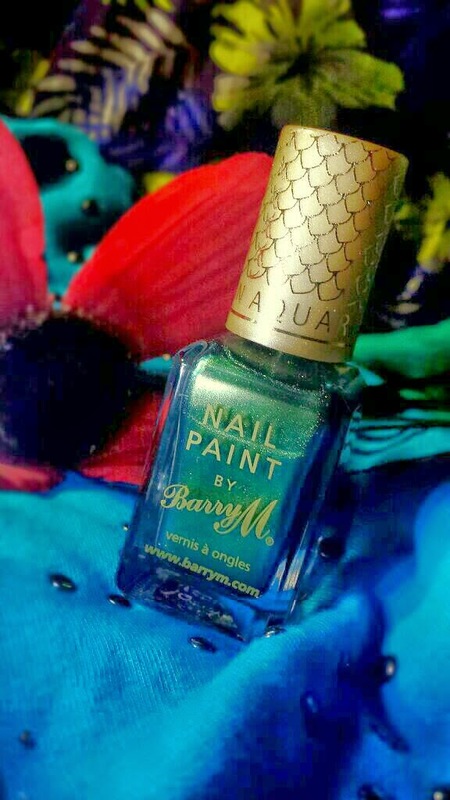 Barry M’s new Aquarium nail paint collection features four two-tone polishes and two glitter top coats all created to provide an ‘under the sea’ effect. 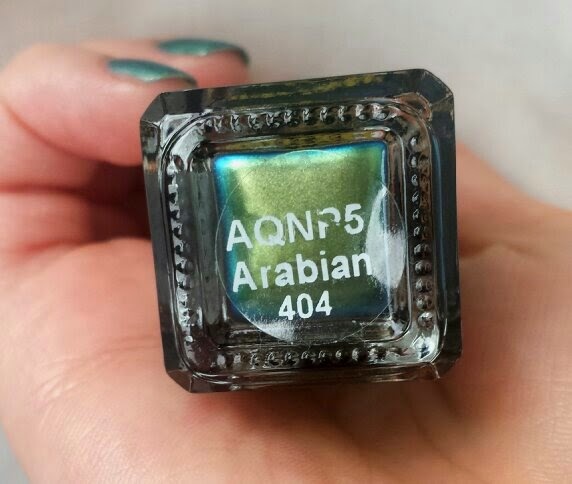 I bought myself a bottle of ‘Arabian’ which is a green and gold duochrome. 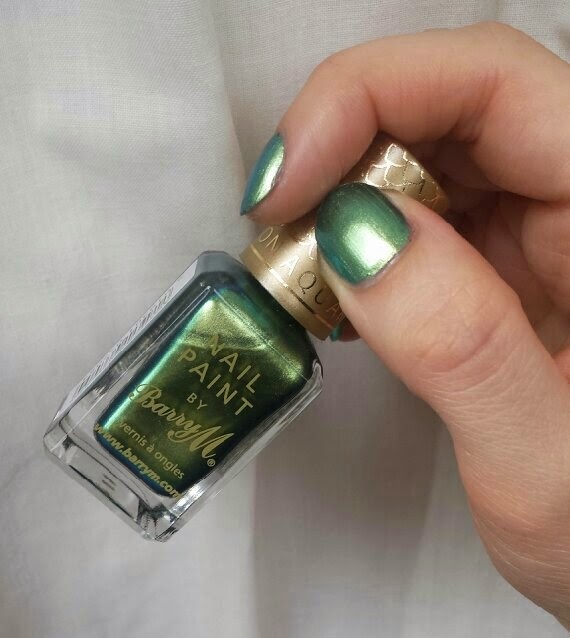 Two nail polish posts this week!? I know, right!? 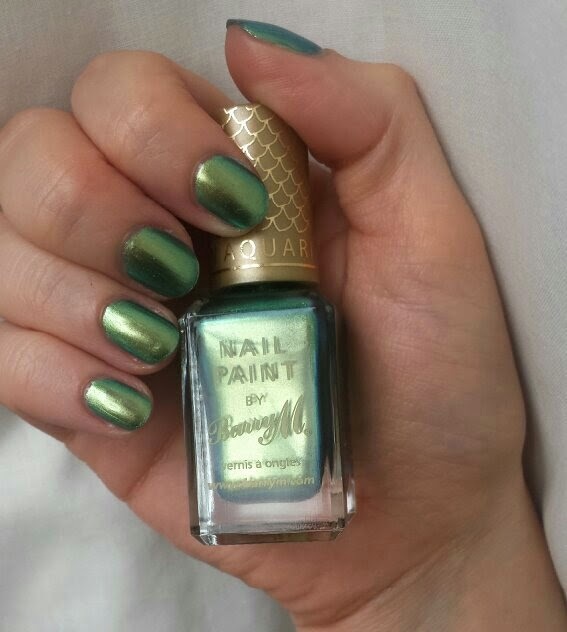 But this polish was simply far too pretty for me to NOT tell you all about it! 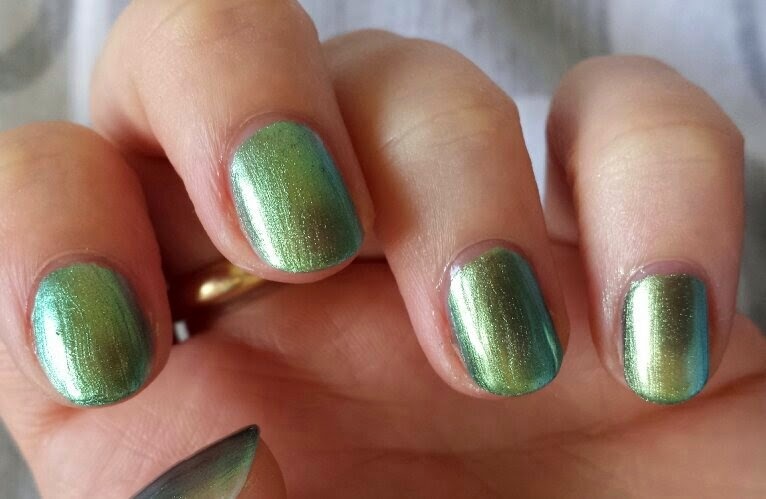 Following on from my review of Rebel by Zoya, I have another cool toned, shining shade for you! 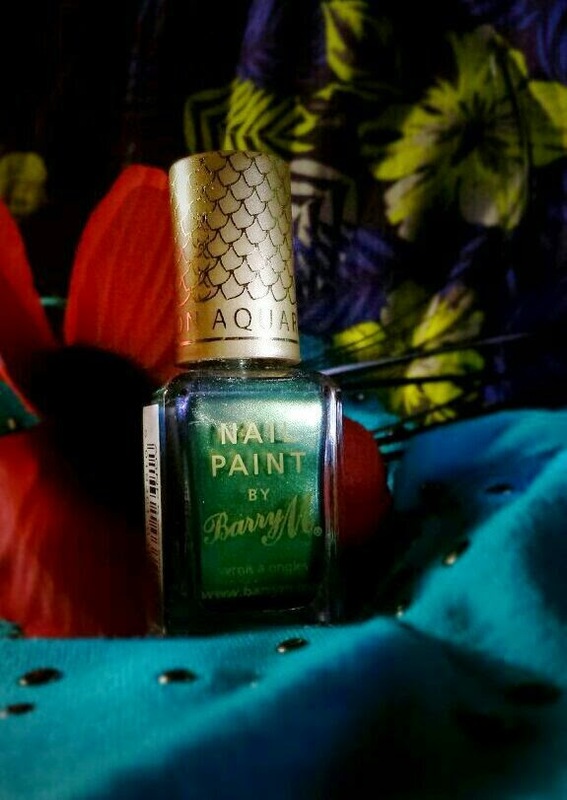 Firstly, this nail polish is big-3-free; dibutyl phthalate, toluene and formaldehyde/formaldehyde resin. For full coverage I only needed to apply two coats. 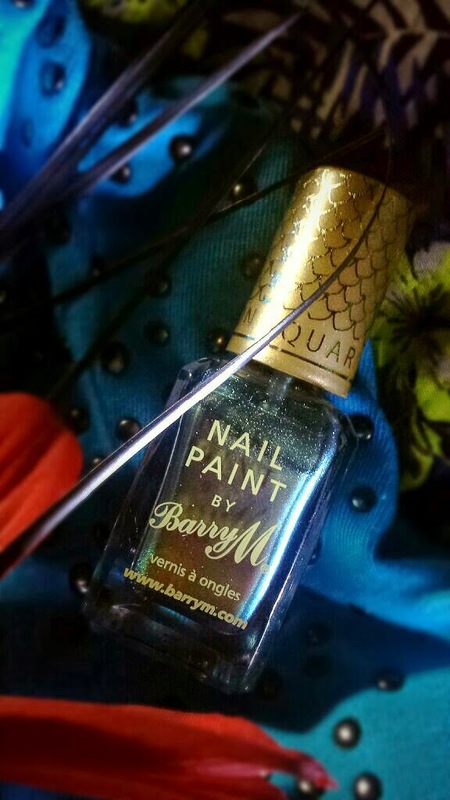 However, as with all duochrome polishes, brush marks can be seen after application. There are tricks to avoid this but it will take a little longer with application time. I decided to skip that part though to show you the final look without the use of tricks! 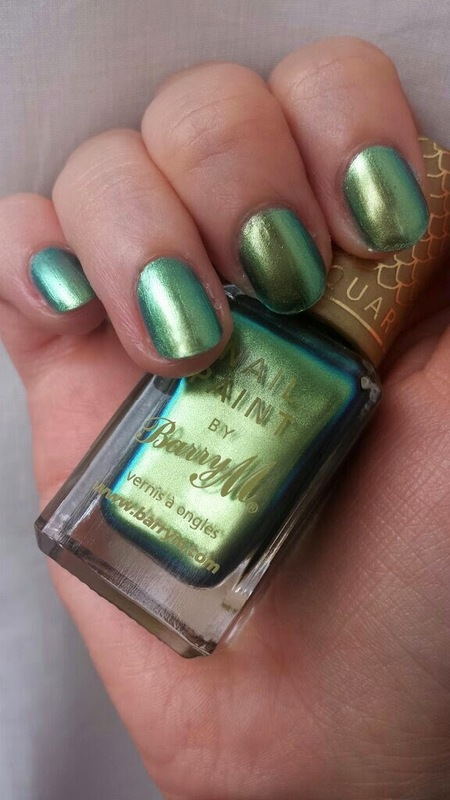 How stunning is this shade!? I tried my very best to get the colour variety within the photos, so apologies for the collection of them. Hopefully you will be able to see how the colour changes! 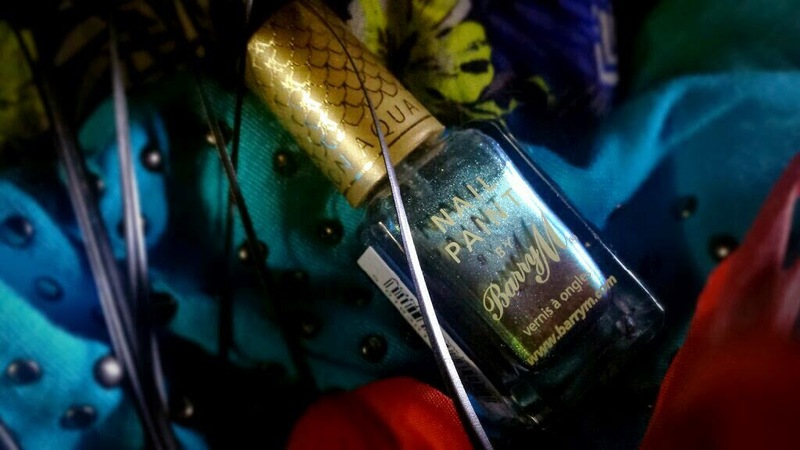 As a warning, the formula of this polish is quite runny, so make sure that you take care when applying or else it could get a bit messy! This slows down the application time somewhat as you have to be more careful to avoid causing a mess. Also because of the brush marks, if you decide to not use the sponge trick then you will probably be spending more time making sure the brush strokes aren’t all over the place. If you have ‘dollops’ of nail varnish left alone to spread across the nail then you will be left with some odd shapes in the colour! 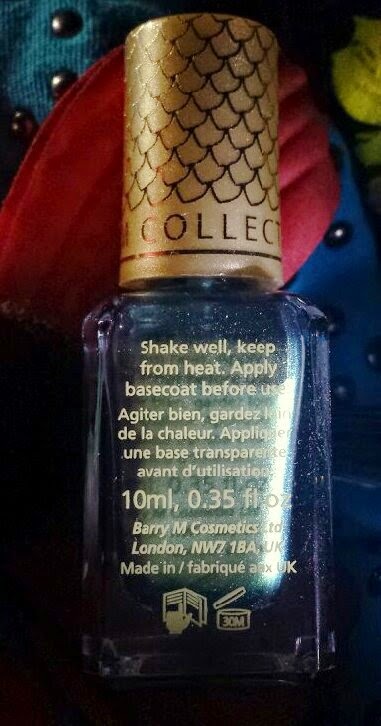 If you are in a hurry then this polish probably isn’t the best to chose purely because of the issues stated above. If you have a bit of time to yourself though then you need to try this out! The final effect is rather beautiful and it will make you stare at your nails all throughout the day, trying to change the colour in different lights (I do this with all chrome polishes)! As always though, I used my Seche Vite to hurry up the drying time so I could be back on the go within a couple of minutes. This colour is an amazing shade for summer to add a 'cool' feel to the hot days. I know I'm going to be wearing this a lot! Also in the Aquarium range is another cool toned chrome and two warmer toned chromes along with one cool and one warm toned glitter topper. Each polish is priced at £3.99 and can be bought in Boots, Superdrug and Nail Polish Direct amongst other places. At the time of writing, Superdrug have a 3 for 2 offer on the polishes! 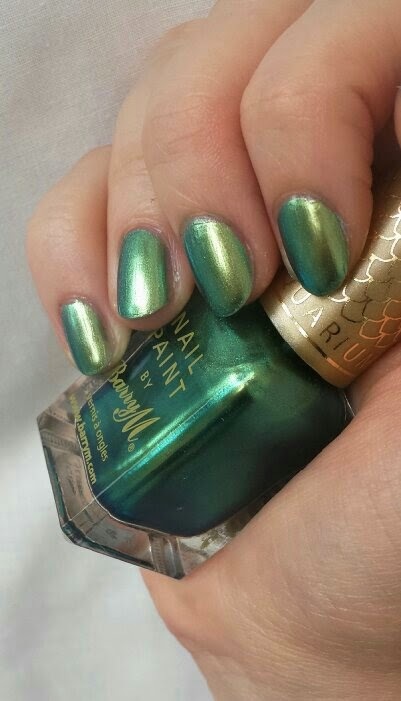 Have you tried out the new Aquarium collection? Which is your favourite?